CCM’s poll unveiled devastating results – as much as 77.8% of the citizens think that party membership is crucial for employment in the state and public administration, whereas 66.9% of the citizens assessed the past practice of employment in the state and public administration as “very unfair and unjust”. The employments in the state administration are unfair and unjust, and the party membership is crucial for getting a job in the state services. These are the results of Center for Change Management’s (CCM) poll, which has been carried out within the Monitoring Administrative Justice project, and was presented on 29 March 2017 in the Aleksandar Palace hotel in Skopje. The public administration reforms are on the list of urgent reform priorities arising from the recommendations given in the Report of European Commission’s group that was led by Reinhard Priebe (June 2015). The hopes are that with these reforms (if implemented) we will finally have professional and efficient administration, free of political or any other influence. However, CCM’s poll results do not trigger optimism that the administration will be free of party influence in the near future and function as a proper public service in favor of the citizens. CCM’s poll produced devastating results – as much as 77.8% of citizens think that party membership is crucial for employment in the state and public administration, whereas 66.9% of citizens assessed the past practice of employment in the state and public administration as “very unfair and unjust”. Moreover, 42.6% of citizens consider the party employments as the reason to consider the employments in the state and public administration unfair. CCM’s research showed that 32.3% of the citizens think that the administration is overcrowded and burdens the economy, whereas 35.6% highlighted that the state and public administration suffer from widespread corruption. On the other hand, the fact that 68% of the citizens pointed out the public sector as the most attractive work place, besides the criticism toward the administration, is rather peculiar. During the presentation of the annual Report on his work, the Ombudsman, Ixhet Memeti, on March 30th stressed the parties’ influence in the state institutions as a serious problem, and he concluded that “the administration works in favor of the parties instead in favor of the citizens”, some media reported. The group employments, on ethnic or party backgrounds, are a project that severely manipulates the citizens. Without specific analysis of the administration’s needs, we won’t be able to talk about quality administrative system. In addition, the conclusion that the administration works in favor of the parties instead in favor of the citizens is utterly disappointing. The situations when the institutions implement party agendas are worrisome (Memeti). 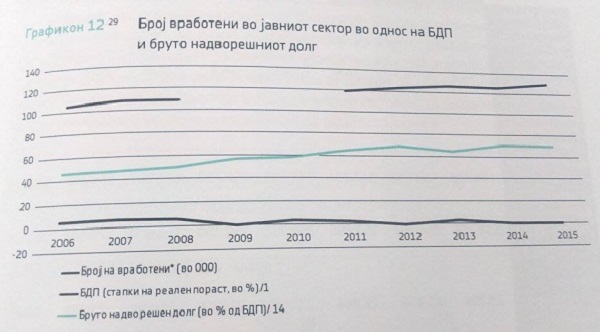 According to the data revealed at the presentation of the Monitoring Administrative Justice project, the number of the employees in the state and public administration has increased for about 25.000 in ten years, i.e. from 105.000 administration employees in 2006 to 129.600 in 2015. CCM emphasized that the number of new administration employments is probably higher, having in mind that in the aforesaid ten-year period some employees have retired. There is a significant increase in the public sector employments between 2006 and 2015. According to the available data, the total number of employments in 2007 and 2008 stagnates, which is later followed by 11.000 employments until 2009 and this number keeps on rising until 2015, when the total number reaches 129.600 employees. The increase of 24.600 employees, or 24.4%, shows the percentage of newly employed in the public sector compared to 2005. However, if you take into consideration the fact that during this period there have been employees who have retired mandatorily or on other basis, then the total number of employees is definitely higher. Additionally, CCM’s analysis on the characteristics of the public sector in the Republic of Macedonia shows that the employees of the public sector amount to 18.59% of the total number of employees in the country. This makes Macedonia’s public sector similar to the public sectors of Western Balkan countries which are members of the EU, and it is smaller compared to the average percentage of all 28 EU member states. EU member states average percentage is 23.47%. Serbia’s and Bosnia and Herzegovina’s public sectors comprise more than 24% of all employees, whereas Slovenia’s and Croatia’s public sectors comprise a bit above 20%, and Bulgaria’s 18.64%. The research data show that the real GDP growth rate for the period between 2006 and 2015 has significantly increased for 5.5% in 2008, which is then followed by a negative growth rate of -0.4% in 2009. After 2009, it starts increasing again, but reaches only 3.8%, which is lower than the real growth rate from 2008. When it comes to the gross external debt (GED), it constantly increases during this period and from 45.7% of the GDP in 2006, it reaches 69.4% of the GDP in 2015. For the entire period from 2006 to 2015, the number of employees in the public sector has increased for 24.4%. The Center for Changes Management concludes that there is not a single economic indicator that justifies such trend.